The story takes place nearly five thousand years ago. Gilgamesh was the king of the wealthy city of Urduk. The king was strong and handsome, but he was also cruel. Gilgamesh forced the people of Urduk to build him great palaces. He also made his subjects live in constant fear. When the people of Urduk begged the gods for help, they led Enkidu to Urduk. Enkidu was also big and strong, but he was wild and ignorant of the ways of civilized people. 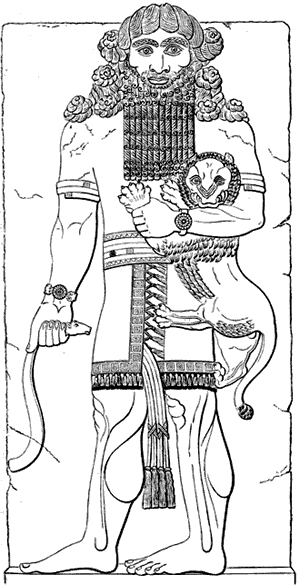 Enkidu was raised in the forest where he lived with the animals. When Enkidu learned of Gilgamesh’s cruelty, the wild man challenged the mighty king to fight. As the two powerful men battled, they realized they admired one another; so instead of remaining enemies, they became inseparable friends. “in order to protect the Cedar Forest [the gods] assigned Humbaba as a terror to human beings; Humbaba’s roar is a flood, his mouth is fire, and his breath is death!" Modern science has discovered that there was a marked increase in the sea levels about 6,000 years ago as the last ice age ended. The melting ice drained to the oceans causing the sea levels to rise more than ten feet in one century. Gilgamesh and the other flood legends may be connected with the end of the ice age. View the Powerpoint Presentation of this lesson. Mr. Donn has an excellent website that includes a section on Mesopotamia. 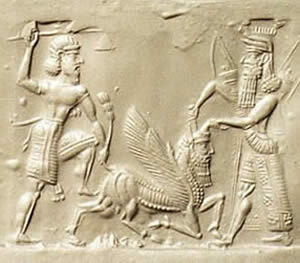 This engraving depicts Enkidu, Gilgamesh and the Bull of Heaven. 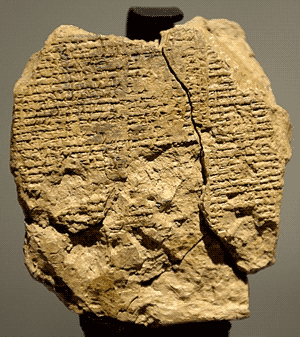 A tablet containing a portion of the Epic of Gilgamesh inscribed in cuneiform writing. This entry was posted in Mesopotamia. Bookmark the permalink.